Lovers of Emily Brontë’s novel have endured much over the years, from William Wyler’s abbreviated Hollywood rendition through Juliette Binoche’s French accented Cathy, the BBC’s radio serial which made the house the narrator, to Tom Hardy sniffing his way through the last TV version. “Oh, damn my soul! but [it’s] worse than I expected – and the devil knows I was not sanguine!” So said Heathcliff on first meeting his son. As a comment on this latest offering, it seems appropriate. Jonathan Holloway’s new radio adaptation promised a ‘modernised and hard-hitting’ version, and listeners were warned that it contained strong language and racist terms. According to Holloway this was ‘.....part of my attempt to capture the shock the book caused when it was published.’ The Daily Express told its readers that the play would ’.....portray Cathy and Heathcliff as listeners have never heard them before.’ This proved to be true, but not entirely in the way the Express reporter meant. Andrew McCarthy of the Brontë Parsonage Museum has been widely quoted as saying that ‘It doesn’t take much imagination to fill in the blanks’ referring to the part of the novel where the child Hareton horrifies Ellen Dean with his ‘string of curses’ and his admission that it is Heathcliff who taught him to swear. There are many points in the story where a modern adaptation might insert the words which Brontë undoubtedly knew but could never write - at least not for public consumption: Heathcliff’s first encounter with the Lintons when his swearing shocks old Mrs Linton; Hindley who ‘entered, vociferating oaths dreadful to hear’ and any number of lesser occasions. In a dramatisation the inclusion of the F-word for such scenes makes some sense: Brontë meant us to imagine stronger terms than ‘damn’ and ‘hell’ so there is no point in being mimsy about it. The problem was not the word itself, but how and where it was used. Its insertion it into dialogue for which Brontë allowed no such implication was irritating but to have it interjected into a massacred version of Cathy’s great ‘I am Heathcliff’ speech was unforgivable. Several terms of abuse used of, and by, Heathcliff jarred horribly less because they were offensive but because they were wildly anachronistic. In a thoroughly modernised version they would have been appropriate but, inserted into the fractured remnants of the original text, they sounded ridiculous. However, the use of offensive language was not the problem. That aspect was a mere curiosity, artistically defensible if properly executed within a high quality production. In this case it was little more than a gimmick, and the whole best forgotten. Whilst there are many difficulties in the way of a satisfactory visual rendition of Wuthering Heights, it would seem perfectly possible to produce a creditable – even a great – radio version of the book. What we had was a disjointed script which gave the impression of being written by someone who had relied on a précis based on a skim-reading of the book. A listener new to the work would have been hard put to follow the plot, while those who know it well could only be infuriated. Jonathan Holloway’s script did manage to keep the main characters more or less to their correct ages – something virtually every film adaptation has failed to do – though Ellen Dean was played by Janine Duvitski as a middle-aged woman throughout. It was Ellen who opened the play with a fanciful speech about the moor, and who was given dialogue and opinions which come straight from Holloway’s mind. According to his Ellen: Hindley Earnshaw’s wife, Frances, was ‘an impoverished, doll-like idiot’; Isabella broke into the Grange after her escape from Wuthering Heights, and the mingling of Cathy Linton’s and Hareton’s light and dark hair were reminiscent of the light and dark curls which went with Catherine to her grave. But the worst is not yet! Holloway’s script used several scenes from the book which are invariably omitted from dramatisations but in virtually every case there was distortion. Ellen’s vision of Hindley as a child at the stone pillar is a notable example. In the book this incident is so sharply evocative that one wonders whether Bronte had her brother in mind when she wrote it. Holloway reduced it to the banal by making the vision a real child – Hareton. Again and again there were changes, additions and contradictions. Mr Earnshaw was away to Liverpool for six days; Isabella went to live in Surrey; Heathcliff had been in the army; Catherine’s final illness was brought on by her being out all night on the moors; Cathy Linton was pleased to discover that Hareton is her cousin; Hareton turned against Heathcliff and threatened him; Ellen told of the ghosts of Catherine and Heathcliff peeping through Joseph’s bedroom window. Joseph, incidentally, was referred to but never heard, while Zillah was made to give Ellen an account of the wedding of Cathy and Linton Heathcliff. We also heard that Edgar Linton gave his nephew up to Heathcliff before the latter made a single demand. To be fair to Holloway, his portrayal of Linton Heathcliff as a self-obsessed, whining, unpleasant wretch was true to the book, but not the deception by which Cathy and Ellen were imprisoned at The Heights. The mangling of the plot at this point was particularly exasperating. The disjointed nature of the plot as portrayed by Holloway has already been noted as bewildering to anyone unfamiliar with the novel. Based on this portrayal, anyone who has heard of ‘Wuthering Heights’ as a story of a passionate love affair, of Heathcliff’s and Catherine’s obsession with eachother, would struggle to understand just why Heathcliff cared twopence for Catherine. Her part was reduced to a few words here and there other than what might be called her great speeches. ‘Great’, however, is not an appropriate word in this context. The scene in which Catherine confides in Ellen about her intention to marry Edgar even though she does not love him as she loves Heathcliff was edited and ’modernised’ into trivial, contradictory nonsense. The interchange in the kitchen of Thrushcross Grange which culminates in Edgar’s attack on Heathcliff and Catherine’s hysteria was similarly reduced. Worse still, Natalie Press’s Catherine delivered her lines in an early BBC accent strongly reminiscent of Joyce Grenfell. As for passion, Violet Beauregard exhibited far more in her desire for a Wonka golden ticket! Doubling up as Cathy II, Press’s voice and flat delivery were exactly the same. This doubling up – David Birrell as Lockwood and Linton Heathcliff and Russell Boulter as Hindley and Hareton Earnshaw – was occasionally confusing and, with the omission of the character of Joseph, implied underfunding. A few seconds, here and there, of incidental music failed to inject any desperately needed atmosphere. Heathcliff, played by Carl Prekopp, did manage to sound devastated at Catherine’s death but, particularly in the second half of the story, his voice lacked the necessary harshness so that his Heathcliff came across as a nice man with a sense of humour trying hard not to be. A Lockwood soliloquy closed the play, but what the character had to say – thankfully not much - simply carried the awfulness to the bitter end. The dereliction of Gimmerton chapel was applied to The Heights, Bronte’s lyrical ending was ignored, and Lockwood, echoing the opening words of Ellen Dean, cursed and blessed the moor. The listener would be heartily forgiven for cursing the BBC for this infliction and blessing it for having the charity to limit it to ninety minutes. Until 5 June 2011. Monday - Saturday 10 am – 5pm; Sunday 2pm – 5pm. Closed 29 April 2011. Entry is free. In 1829, describing the founding of Glass Town, Charlotte Brontë wrote: ‘How long has it taken to rear the Grand Hall where we now are? Have not those marble pillars and that solemn dome been built by supernatural power? If you view the city from this Gothic window and see the beams of the morn gilding the battlements of the mighty towers, and the pillars of the splendid palaces which have been reared in a few months, can you doubt that magic has been used in their construction?’ If the 13-year-old Charlotte could have seen the original painting of ‘Belshazzar’s Feast’, a mezzotint of which surely influenced her first vision of Glass Town, she might have imagined that the artist too had worked under the influence of magic. There is something distinctly strange, surreal, about Martin’s work, something – one is tempted to believe - precognitive and uncannily knowing. The scale of his representations of Belshazzar’s palace, of Nineveh and Pandemonium reminds one of the vastness of the computer generated cities of “Star Wars”, or the similarly devised landscapes of “The Lord of the Rings”. To look at the depiction of the destruction of the earth in his ‘Last Judgement’ is to be reminded painfully of the recent disaster which struck Japan. 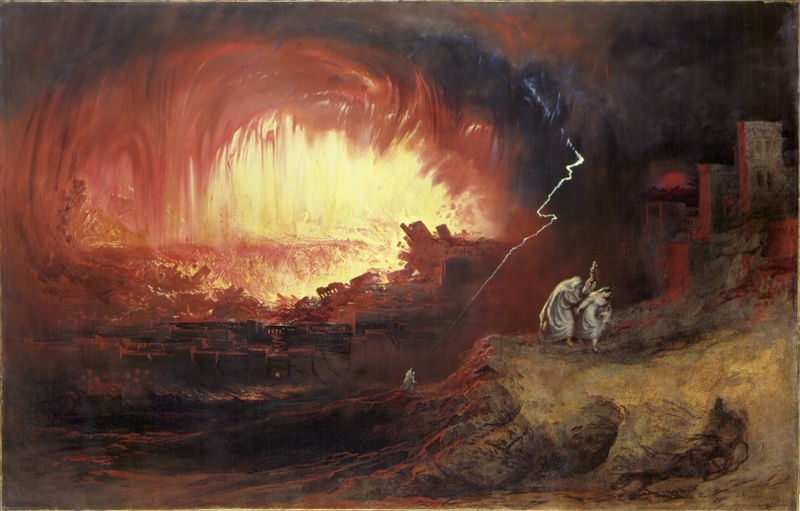 Not for nothing was that event described over and over as being of biblical proportions, and biblical proportions are what John Martin produced so successfully. The exhibition occupies the five galleries which make up the whole of the first floor of the gallery and as such, is the largest the Laing has ever mounted. Each room’s display is themed to tell a part of Martin’s story from his birth in 1789 at East Landends near Haydon Bridge in Northumberland, to his death on the Isle of Man in 1854 using clear wall-mounted text boards which, cleverly sited, are accessible without being intrusive. Indeed, both the staging and the lighting of the exhibition are superb: nothing is allowed to detract from the works. The atmosphere is comfortable, the staff friendly and helpful, and there are plenty of places to sit down. It is obvious that Martin always intended his art to be commercial. Whilst working as a painter on ceramics he produced small landscapes, watercolours of classical subjects and illustrations for prints, all of which were designed to sell. Some of his earliest oils seem somewhat flat and almost amateurish: two small paintings of Kensington Gardens, both done in 1815, do not prepare one for the awesome scale and drama of the Welsh mountain landscape of ‘The Bard’ (1817). Again and again he painted cities which appear almost organic: growing out of crags and peaks apparently intended not merely to impress but to overawe, and when Martin illustrates destruction, be it Sodom and Gomorrah, Nineveh or the earth itself, he does so with all the visual tropes of a modern disaster movie. Although Martin was never beloved of the art Establishment, he enjoyed a long period of commercial success largely through the production of mezzotint prints of his most popular works. As well as ‘Belshazzar’s Feast’ the Brontës owned ‘Joshua Commands the Sun to Stand Still’ and ‘The Deluge’. They may also have had a copy of ‘St Paul Preaching at Athens’ all of which feature in the exhibition, as does ‘The Last Man’ which Charlotte saw on her visit to London in 1850, describing it in a letter to her father as “a grand, wonderful picture”. She might have added that it provokes a strong sense of desolate misery. Many of Martin’s prints were used in popular annuals of the time, some of which the Brontës owned, and it was common for publications such as Blackwood’s Magazine to analyse popular works in great detail. In July, 1828 Blackwood’s published a detailed description and critique of Martin’s ‘The Fall of Nineveh’ which is believed to have influenced Charlotte’s poem ‘The Trumpet Hath Sounded’ (December, 1831). It is easy to imagine, whilst viewing the main part of the exhibition, that the young Brontës must have wished for coloured reproductions of Martin’s works. However, the display of mezzotints in the Barbour Gallery allows a completely different view of Martin’s best-known pictures. While the prints lack the drama of colour, this is more than compensated for in sharpness of line and detail. The monumental scale of the buildings, the ominous quality, the turbulence of celestial phenomena are depicted with a startling clarity. There is a sinister eeriness about the prints which is not present in the paintings. In short, the mezzotints are far more frightening than the coloured works. The final section of the exhibition, The End of All Things, shows Martin’s last great work: the three enormous paintings entitled ‘The Great Day of His Wrath’; ‘The Last Judgement’ and ‘The Plains of Heaven’, all painted between 1851 and 1853. Each one is disturbing, either obviously or subtly. One expects to be disturbed by scenes of cataclysmic annihilation; one does not expect to find a representation of heavenly bliss unsettling. It may have been entirely unintended, but in the waterside rocks of paradise one seemed to see the ghosts of those monumental, monstrous palaces and colonnades which one had just seen swept away at the last judgement. The Laing Art Gallery is staging John Martin: Heaven and Hell as part of ‘The Great British Art Debate’, a partnership project between Tate Britain, Tyne and Wear Archives & Museums, Norfolk Museums and Archaeology Service and Museums Sheffield. The Great British Art Debate is a series of events and exhibitions bringing art from national collections to the regions. It aims to encourage the public to join in a debate about what British art has to say about identity and Britishness today. The exhibition will also be staged at the Millennium Galleries, Sheffield from 22 June to 4 September, and at Tate Britain, London from 21 September to 15 January, 2012. The Laing has a pleasant cafe offering a good range of snacks and meals at reasonable prices. There is also a shop selling postcards, prints, gifts and books. In stock is “John Martin Apocalypse Now” by Barbara C. Morden which tells Martin’s story, exploring the nature of his art with lavish illustrations. It is published by Northumbria Press at £30.00. Ponden Hall is up for sale. All the details are here. The main tradition, however, is that it is identifiable with Thrushcross Grange, home of the Lintons: it would probably have seemed grand to the Brontës, with few other large houses in the area, but again there is no evidence at all. The Grange was in a large park, too. The library has been dispersed to who knows where since the late nineteenth century when many of the books were sold off in a Keighley market-place. Perhaps someone there still has a Shakespeare First Folio in an attic. You would still have to be well-off to buy the place: the interior has been refurbished brilliantly. A major exhibition of John Martin's paintings opened on 5 March at the Laing Art Gallery, Newcastle-upon-Tyne. The exhibition, which will run until June, features eighty of Martin's oil paintings including Belshazzar's Feast, which is on loan from America. This is a rare opportunity to see the originals of the prints which inspired the young Brontës when they created their imaginary worlds. Entry to the exhibition is free. He was father to three of the most famous authors in the world yet most of us know very little about Patrick Brontë. This year marks the 150th anniversary of his death in 1861 and the Brontë Parsonage Museum will be opening a new exhibition to celebrate the life and work of this ‘somewhat eccentrik’ Irish curate. The exhibition, Patrick Brontë: In His Own Right will open on 17 March, St Patrick’s Day. Patrick was born in Ireland in a small cabin and was the eldest son of a poor farmer. From a very young age he was highly ambitious, enthusiastic and intelligent; by the time he was just sixteen he had already opened his first school. A few years later Patrick had secured himself a place at Cambridge University to pursue a career in the Church. He left Ireland for England where he was to spend the rest of his long life, eventually settling in Haworth at the Parsonage. The exhibition will also feature a number of important loan items from the John Rylands Library at the University of Manchester and the Brotherton Library at the University of Leeds. After the death of his last daughter, Charlotte, Patrick asked Elizabeth Gaskell to write “an account of her life”. The letters on loan from the John Ryland’s Library document Patrick’s involvement in the first biography of Charlotte Bronte by providing Gaskell with background information on his early life and memories of his daughter. Also included in the exhibition will be a very special letter on loan from the Brotherton Library in Leeds. Written by Maria Branwell before she married Patrick, it is addressed to ‘My Dear Saucy Pat’ and is one of the few surviving letters that exist by Mrs Brontë, giving a wonderful insight into their courtship. After the sudden death of his wife, Patrick was left to raise their six young children on his own; of which his three youngest girls made them the most famous literary family in the world. He outlived all of them, eventually dying at the age of 84. Paul Daniggelis in Texas sends this link - following on from the piece about the New York-based Martha Graham Dance Company's companion piece to Deaths and Entrances for the troupe’s eighty-fifth anniversary celebrations. This book is the work of an accomplished teacher, to be sure, someone who gets to the point quickly and who knows when not to go on for too long. Drawing heavily on sources such as the monolithic The Brontës by Juliet Barker and also the Selected Poems that Barker edited for Everyman, Anne Crow presents us with a concise and readily accessible survey, with extensive quotations to illustrate the frequent salient points which she makes. She includes an excellent four-page chronology near to where her text commences, which begins in 1776 (American Declaration of Independence, in the year before the birth of Patrick Brontë) and ends with that patriarch’s death in 1861. Included are most events and publications which could be construed as relevant: The Tenant of Wildfell Hall, for example, is placed next to the rejection of the Third Chartist petition in 1848, along with the deaths of both Branwell and Emily. Crow is careful in particular to include plenty of background and information on Patrick to begin her survey, with interesting extracts and commentaries on Cottage Poems which are frequently skimmed over by those who want to home in, perhaps too speedily, on the lives and works of his talented son and daughters. Some of Patrick's poems have plenty of charm, while others seem bland, in spite of clever crafting. All are hard to obtain. There is concise information on both Thornton and Haworth – all going over well-trodden earth – and evidence of some personal research, with some poignant photographs taken (by Crow herself) in Haworth cemetery. Crow’s selections are a little scanty, and not entirely ‘predictable’. She gives almost equal space to the poems of Patrick and Branwell as to those of each of the sisters, which seems like an invitation to scrutinise, say, Branwell’s The desolate earth (written during his time at the Luddenden Foot railway station) with the same critical eye as Anne’s Lines Written at Thorp Green. This could be a very useful exercise for a group of sixth formers studying for A level! It can be bought from the Parsonage shop.